American Greetings Introduces Digital Slideshow Cards | OhGizmo! Believe it or not, sometimes a folded piece of cardboard just can’t convey how you feel about someone. 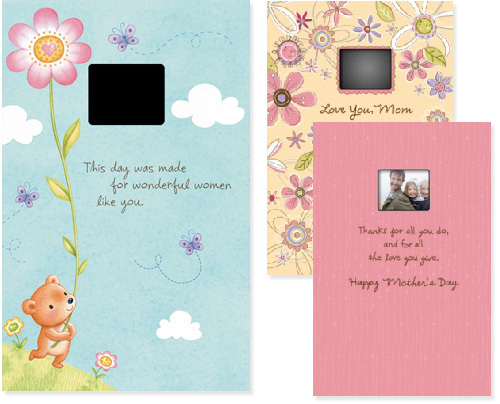 So just in time for Mother’s Day American Greetings is introducing a digital slideshow card which features a 1.8-inch LCD display that plays back a series of photos set to music. Preloaded versions that run through a collection of animated slides are available, but I suspect most people will prefer the customizable version which includes a short USB cable allowing you to upload up to 50 photos. When the card is opened the slideshow and music automatically start playing, and the cards are rechargeable so they can be enjoyed again and again. Personally I think it would be cool if you could load up your own MP3 as well, allowing you to have a customized soundtrack or message, but I’m sure the pandora’s box that is copyright issues will ensure that will never happen. Really nice card and i am agree with Tormozniak, Where to buy? The card is awesome,I am willing to purchase one , where is this card available?